Dry Needling is a hands-on therapeutic approach to treat Myofascial Pain and Dysfunction. A variety of needling techniques are used during the treatments to inactivate myofacial trigger points, and to restore normal muscle tones, muscle length, coordination, function and strength. All skeletal muscles anywhere in the body can be treated this way. A myofascial trigger point is a hyperirritable spot in a muscle which is located in a taut (tight) band and is painful to touch. This hypersensitive spot or nodule (the “knot”), can give characteristic referred pain, referred tenderness and other referred symptoms in areas other then where the muscle is located. (Travel and Simons in Myofascial Pain and Dysfunction: The Trigger Point Manual). Janet Travell, MD first described the existence of trigger points in the 1940’s. There are several ways to treat myofascial trigger points. Travell and Simons note that trigger points can be treated by ischemic compression, with spray and stretch, injection with local anesthetic (trigger point injections) and with dry needling. Dry Needling is a valuable, effective and efficient adjunct treatment to inactivate myofascial trigger points. It is an invasive procedure in which a thin solid filament sterile needle is used. Dry Needling involves insertion and repetitive manipulation of the needle in the myofascial trigger point. The purpose of this technique is to inactivate the myofascial trigger points by producing a local twitch response. This local twitch response then releases the shortened bands of muscle fibers. The result is muscle relaxation and pain relief. Eliciting this local twitch response is key for successful deactivation of the trigger point. No medication of any kind is injected. Inactivation of the trigger points can bring immediate relief of symptoms. The advantages of dry needling over other treatments are that we can treat parts of the muscle, and deeper layers of muscles, which our hands and fingers cannot reach. Also, this method is far superior in achieving a local twitch response over other manual techniques. In addition, there are no drugs used so we can treat many trigger points during each treatment. Thus, results are achieved with dry needling which cannot be obtained with any other treatment. Dry Needling is an invasive procedure and should be performed only by those clinicians who have taken additional study and coursework in this topic and who are qualified to perform this treatment. At this time, there are only a few chiropractors and physical therapists certified in intramuscular manual therapy. Dry Needling must not be confused with any type of acupuncture. Whereas acupuncture is founded on Traditional Chinese Medicine (Dry Needling is based on Western anatomical and physiological principles. It is founded by scientific concepts and it continues to evolve using the latest research. Dry Needling is never a treatment by itself. It is always done in conjunction with other manual and physical therapy treatments, such as exercises, postural training, education and other hands on techniques like soft tissue work and manipulation. Since full pain free range of motion is the ultimate goal of myofascial treatments, we teach the muscles the right away to work in their newly-gained pain free range to restore their normal function. It is important that you are an active participant in your own treatments and well being. Therefore you must follow through with your home exercise program which we will establish specifically for you. There is no specific, predetermined number of treatments for patients with myofascial pain. Chronic conditions will require more treatments than acute conditions. In addition, the amount of treatments will also depend on concurrent other medical conditions, your compliance with the exercises, your age and physical condition, and on the amount of visits ordered by your physician and approved by your insurance company. 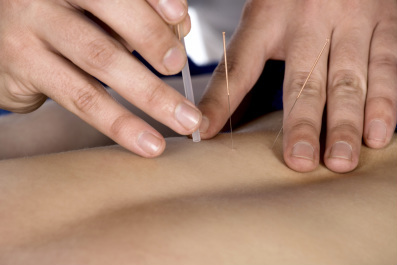 The primary effect of Dry Needling is that it produces a local twitch response. This results in muscle relaxation due to the release of shortened bands of muscle fibers. There are currently several hypotheses regarding the exact mechanism of pain relief. Lewitt demonstrated the effectiveness of Dry Needling in 1979 in a groundbreaking study which was published in Pain. Frost, et.al.proposed that it was the needling procedure itself which caused a muscle relaxation due to stimulation of the spinal reflex arc, and not because of the injected medication. Hong and others emphasized the importance of eliciting a local twitch response during the application of any needling technique. They also found in a clinical trial that trigger point dry needling technique is equally effective as an injection with 0.5% lidocane. When treating the upper Trapezius muscle, they found no difference in reducing pain intensity, muscle pressure sensitivity on pressure algometry, and there was an equal increase of cervical range of motion. The approach of Chan Gunn, MD from Vancouver, BC, is that chronic myofascial pain (which he describes as being a chronic pain condition that occurs in the musculoskeletal system with no obvious sign of injury or inflammation) is caused by an underlying neuropathic condition. This is treated not only by dry needling the affected muscles, but also by including the needling of the corresponding paraspinal (back) musculature. This neuropathic pain model is the foundation for his treatments. His Institute for the Study and Treatment of pain (iSTOP) identifies this total system for the diagnosis and treatment technique as Intramuscular Stimulation (IMS). In addition, he supports that there is a histamine release that causes local irritation and relaxation of the muscle. According to Fischer the mechanism of Dry Needling that seems to provide muscle relaxation and pain relief, is that Dry Needling mechanically breaks up the nodularity of the tissue. In Ingber’s opinion, the mechanism is one of a decrease in stiffness of the muscle through an electrical event. Decrease of stiffness increases the flexibility of the muscle, which is then maintained through myofascial stretching exercises. Yet others indicate that a little bleeding causes release of so called platelet derived growth factors, which aids in the healing of the muscle. Studies by Shah, et.al., published in 2005 and 2008, are clearly demonstrating that soon after a local twitch response is obtained, normalization of the pH and of several biochemicals and neurotransmitters occur in the environment surrounding the trigger point. Specifically: normalization of levels of concentrations of protons, bradykinin, calcitonin gene-related peptide, substance P, tumor necrosis factor-?, interleukin-1?, serotonin, and norepinephrine were seen. These chemicals are involved in regulation of pain. Therefore, normalization of these levels will decrease the pain. Dry Needling may cause an increase in pain which can last from a couple of hours to several days, followed by an expected improvement in the overall pain state. This increase in pain is mainly caused by the “twitching” of the muscles. It is also related to over activity of the shortened muscle bands that have not been released, or sometimes there is a temporarily increased spasm of the treated muscles. Like any medical procedure, there are possible complications. While these complications are uncommon, they do sometimes occur and must be considered prior to giving consent to the procedure. Any time a needle is used there is a risk of infection. However, we are using new, disposable and sterile needles, and infections are extremely rare. A needle may be placed inadvertently in an artery or vein. If an artery or vein is punctured with the needle, a hematoma (or bruise) will develop. If a nerve is touched, it may cause paresthesia (a prickling sensation) which is usually brief, but it may continue for a couple of days. When a needle is placed close to the chest wall, there is a rare possibility of a pneumothorax (air in the chest cavity). Prior to the treatment, a history will be taken and an examination will be performed. Patients need to inform us if they have conditions such as pregnancy, if they have implanted devices like a pacemaker, a bone stimulator or other electrical stimulators, and if they use medications like blood thinners or immunosuppressants. To lessen the discomfort, some authors suggest taking extra Vitamin C starting 1-2 days prior to the treatment and for 1-2 days following the treatment. Several of our patients concur with this recommendation. A gown may be provided if your clothing is inhibitive to the area of treatment. You will be in a comfortable position; usually lying on your stomach or on your back. When the needle is inserted you may feel a little prick though the skin. If your muscles are relaxed you may hardlIf the muscle is tight you may notice slight discomfort. When the needle hits the trigger point, there will be a local twitch response. This twitch response is very brief and unexpected. It can be momentarily painful. During your visit, multiple trigger points in several areas will be treated. After the treatment areas may become sore. This is a muscular soreness; therefore, modalities to decrease muscle pain sometimes are performed afterwards.